Ketumbeine is a village with 161 households (800 inhabitants) situated 36 km from the grid and three hours driving from Arusha. As many other villages in Africa, people use traditional sources of electricity (kerosene, candles, small gensets) or solar home systems offered by local companies. 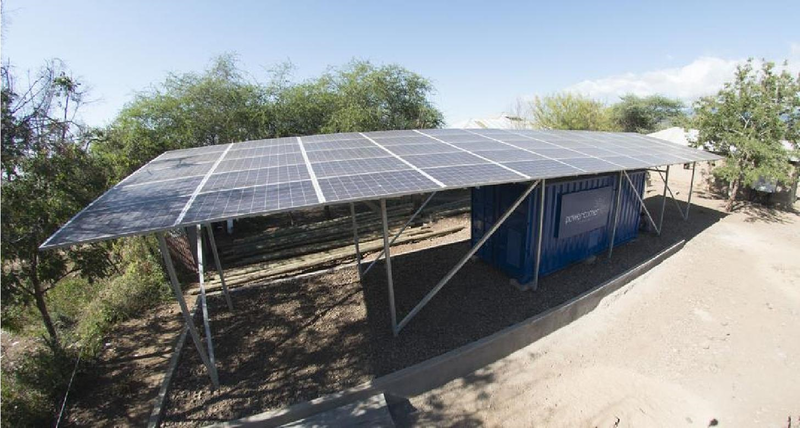 The demand assessment showed an energy demand of 16,000 kWh/year that will be covered with a hybrid containerised mini-grid of 16 kW of PV panels, 45 kWh of Lithium batteries and a back-up genset. The purpose is to cover all needs of the local community and to become an enabler of economic growth. As a result, with a combination of electricity available 24/7 and proposing energy efficient appliances and machines, economic activities like agriculture, commerce, small industries and a small lodge can be supported. The major obstacle to overcome was to make PowerCorner a compelling solution for the local population as several solutions were already available. A solution compatible with the dynamics of the community, while being affordable for the population thus had to be found. The use of renewable energies technologies like solar PV and storage allow us to offer the most reliable and clean solution to provide electricity to off-grid concentrated and dense populated villages. On top of the technical solution, PowerCorner proposes an innovative business model that can guarantee the reliability and life duration of the system, involving also the local community with a kiosk integrated in the container. Clients pay a deposit upfront (connection fee) and a smart meter for charging the consumption on a pre-paid basis is installed. Payments are done by Mobile Money. Finally, a local operator in the village was trained to manage the site and provide technical and commercial services to the clients. PowerCorner’s pilot project in Ketumbeine was financed entirely by ENGIE. Overall costs for the pilot were 140,000 EUR. The pricing model for the end-users reflects their ability to pay and the costs involved in the mini-grid overtime (CAPEX and OPEX) aligned with current needs and future wills of the population. The specific project will not pay off in terms of economic return itself but it will be tested for a roll-out of several mini-grids in Tanzania for ENGIE that will prove the economics and returns of the business model at scale. PowerCorner in Ketumbeine was commissioned in March 2016 and currently provides electricity to 50 clients, including households and SMEs. The goal is to adapt and replicate the model in other towns in Tanzania as well as developing new pilots in other countries in Africa.